How to convert grams to cups and cups to grams? How many grams in a cup of my product? The grams to cups calculator will help you in your daily life. Here we present the conversion for the most popular kitchen ingredients. If you ever wondered how many grams are in a cup or how to convert 100 grams to cups, you are in the right place. As you can see in the formulas above, providing only the amount of grams is not enough to convert cups to grams. We need to know what is the density of the ingredient which we want to convert. To make it more complicated, there are a couple of different types of cups, so we need to know what is our recipe's country of origin. The most often used cup volume is the US customary cup with its 236.59 mL of volume. If you have a recipe from the USA, you may be pretty sure that it's what the authors meant. There is also another cup type in the USA, and it's called a legal cup. It is used in nutrition labeling, and it measures 240 mL. Other countries occasionally use cup unit and the recipes normally weigh non-liquid ingredients in grams rather than measuring volume. UK imperial cup was used in pre-1970 recipes. Sometimes the metric cup (250 mL) is still used in the UK, Australia, New Zealand, Canada and South Africa. 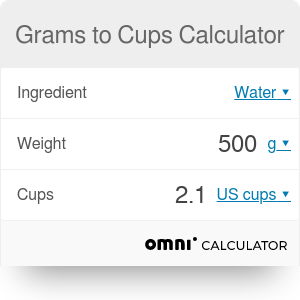 In our grams to cups calculator you can choose between the first three cup types. Those values are only approximate and may be slightly different for your ingredient, as the density of the substance varies with pressure and temperature. Also, it is important how tightly the ingredient is packed into the cup. In our calculator we present ten popular ingredients, next ten products may be found in the advanced mode. If you still didn't find your ingredient on our list and you want to be super accurate, you can visit for example this density database. Find your product, type its density into proper field, and the grams to cups calculator will convert it for you. If you need to convert the units of volume only, use our volume converter. Grams of flour, cups of milk... We are getting hungry, aren't you? Check our great pancake recipe calculator! Grams to Cups Calculator can be embedded on your website to enrich the content you wrote and make it easier for your visitors to understand your message.